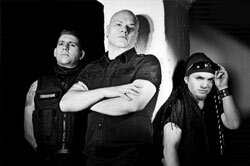 EISENFUNK are a industrial trio whose 2007 self-titled album proved popular within Germany’s alternative music scene, well placed in german DAC charts. Originally founded in 2006 as a solo project by singer/producer Michael Mayer, EISENFUNKÂ made their recording debut in 2007 with the album EISENFUNK on the Danse Macabre sublabel Biohazzard Records. Following this initial release, Mayer recruited Arthur (electronic drums) and Toni (keyboards, samples) to join the band and proceeded as a trio. Released in October 2007 as EISENFUNK, the new album steadily grew in popularity, ultimately climbing to number two on the German alternative albums chart in March 2008. Around this same time, theyÂ released the limited-edition EP 300 (2008), comprised primarily of remixes. Becoming a leading member of the german industrial scene, the bavarian trio released the next CD in 2009, that was named “Schmerzfrequenz”. As with every release before, this one climbed into high DAC rankings too and opened the band the way to european fans. In this time, videos became a central position not only in their performance. In 2010 EISENFUNK released their masterpiece. With 8BIT, the band played computer games in everyones heart and collected fans all over the world. Now, 5 years after founding the band, the munich guys are preparing the birthday celebration with “PENTAFUNK”, the 5th release in five years.